Railpictures.ca - A.W.Mooney Photo: CP 1868 purposely sends up a whiff of alco smoke for the photographer before beginning the day working local traffic brought down from Guelph. This unit in later years went to toil for the New Brunswick East Coast Rwy, until the NBEC takeover by CN in 2008. | Railpictures.ca – Canadian Railway Photography – photographie ferroviaire Canadienne. 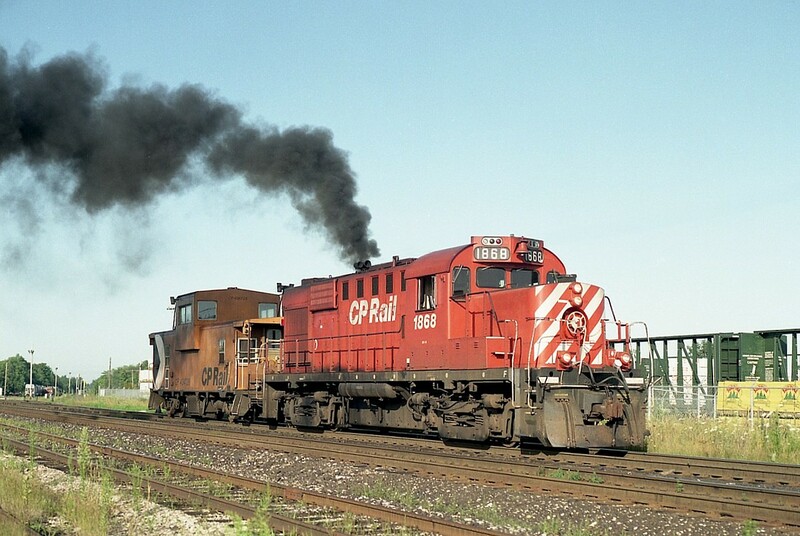 Caption: CP 1868 purposely sends up a whiff of alco smoke for the photographer before beginning the day working local traffic brought down from Guelph. This unit in later years went to toil for the New Brunswick East Coast Rwy, until the NBEC takeover by CN in 2008. Thanks, but don’t let David Suzuki see that comment, or he will be at your door giving you a lecture.